The site is run by Christmas Ice Rinks Ltd which is a company registered in England & Wales, Registration no. 07188465. Registered office address: 3 Stour House, Clifford Park, Clifford Road, Stratford upon Avon CV37 8HW. The site owner can be contacted by email at [email protected]inks.co.uk. When visitors use the contact form on the site we collect the data shown in the comments form, and also the visitor’s IP address and browser user agent string to help spam detection. These cookies are used by the Content Management System for this site. Session ID SESSIONID This cookie is essential for the website to operate and is set upon your arrival to the site. When you close your web browser. These cookies are used to collect information about how visitors use the website. We use the information to compile reports and to help us improve the site. The cookies collect information in an anonymous form, including the number of visitors to the site, where vistors have come to the site from and the pages they visited. For more information please see Google Analytics Privacy Overview, Google Analytics Opt-out Browser Add-on. Google Analytics __utma This cookie is typically written to the browser upon your first visit to the site from that web browser. If the cookie has been deleted and the browser subsequently visits the site, a new __utma cookie is written with a different unique ID. This cookie is used to determine unique visitors to the site and it is updated with each page view. Additionally, this cookie is provided with a unique ID that Google Analytics uses to ensure both the validity and accessibility of the cookie as an extra security measure. After 24 months. Google Analytics __utmb This cookie is used to establish and continue a user session with the site. When a user views a page on the site, the Google Analytics code attempts to update this cookie. If it does not find the cookie, a new one is written and a new session is established. Each time a user visits a different page on the site, this cookie is updated to expire in 30 minutes, thus continuing a single session for as long as user activity continues within 30-minute intervals. After 30 minutes. Google Analytics __utmc This cookie is no longer used by Google Analytics. Historically, this cookie operated in conjunction with the __utmb cookie to determine whether or not to establish a new session for the user. For backwards compatibility purposes, this cookie is still written and will expire when the user exits the browser. When you close your web browser. Google Analytics __utmz This cookie stores the type of referral used to reach the site, whether via a direct method, a referring link, a website search, or a campaign such as an ad or an email link. It is used to calculate search engine traffic, ad campaigns and page navigation within the site. The cookie is updated with each page view to the site. After 6 months. Google Analytics __utmv This cookie stores the type user that you are when you access the site. For example, whether you are a ‘Guest’, a ‘Subscriber’, or a ‘Member’. This allows us to see how each type of user makes use of the site. After 24 months. This site uses Google Analytics to track the performance and usage of individual pages and the site as a whole. To achieve this, certain cookies (see above) are stored on your browser to keep a record of the pages you visit along with browser and operating system data. This data is anonymised and will not be used to personally identify individual users. This site does not currently share data with any other companies except in indiviual cases where your permission will be sought in advance. 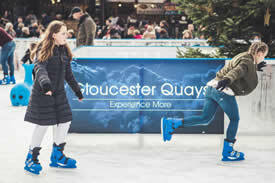 All data submitted to and via this website is stored on a secure server accessible only to certain employees within Christmas Ice Rinks Ltd and is only transferred elsewhere when deemed absolutely necessary. In such cases, due care is taken to safeguard any data. Furthermore, any data we hold is reviewed regularly and deleted when it is no longer considered necessary for the operation of the business. Christmas Ice Rinks Ltd is registered as a Data Controller with the Information Commissioner’s Office under registration reference ZA216144. You have a right to find out what data we hold about you and also to have that data removed ‘Right to be forgotten’. For such requests please contact [email protected] by email.